I'm back with the last post in my series about how to take a successful road trip with your family. 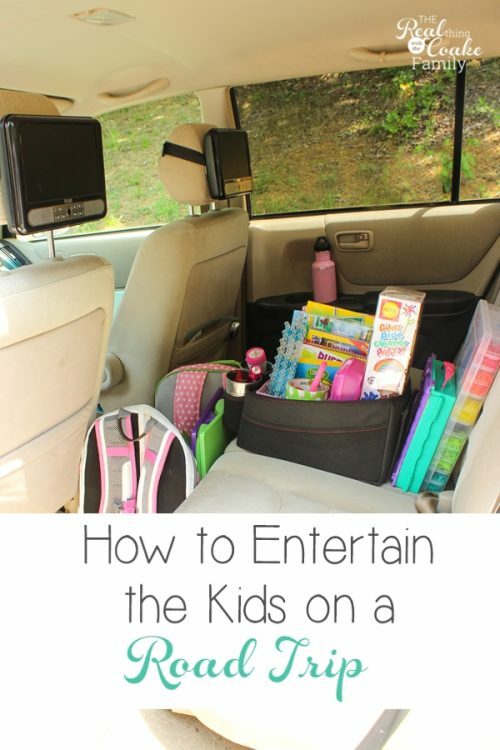 Today, I want to give you some specific ideas of how to entertain the kids on a road trip. I already showed you what I consider to be the best apps for a road trip and how I packed for our last road trip. The last thing we need to consider to make it more likely we will have a successful road trip is entertainment. I'm going to assume that if you have more than one driver in your car, you and your other drivers are old enough to figure out what will entertain them. 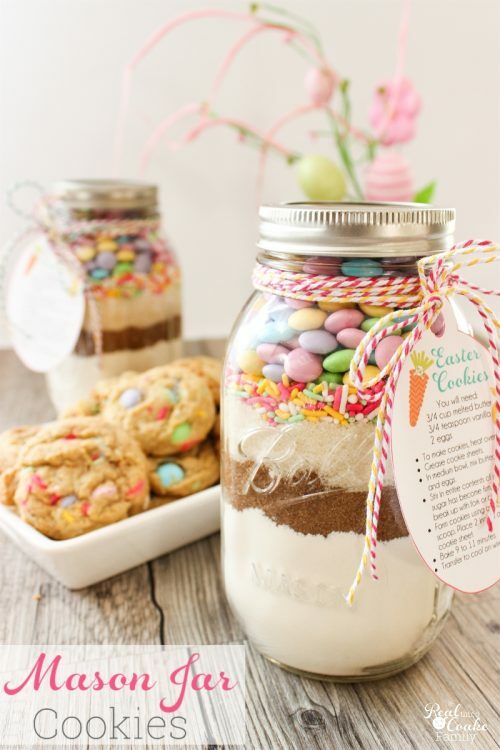 Today, I'm just going to give you ideas that were very successful for us last summer for the kids. I have 2 girls who were 12 and 7 at the time of this trip. I realize that my ideas are a bit heavy in the girl category, but I do have girls. I also think that you can easily use my ideas as a springboard for your own ideas for your kids whether they are boys our girls and quite a few of the ideas are great for both genders. I generally prefer to limit the amount of electronic time my kids have. I was a little bit more relaxed in the car than I would be at home. On our road trip, I usually let my kids watch one movie or show in the morning and one in the afternoon. That is a lot compared to what they watch at home. It still left quite a bit of time that needed to be filled. (affiliate link) that would strap to the headrests. The reviews on what I bought were OK, but not great. I took a chance, which I rarely do. We had no issues at all. The one pointer I will give you, if you were to buy this particular player, one of the players is the master and one is the slave. When you are playing the same DVD on both screens you have to put the movie in the Master player or the screen on the other player will be a little bit messed up. Once we figured that out, we had a great experience with our DVD player. It has the ability for the kids to each watch their own movie or they can hook them together (with a cord) and watch the same movie. Mercifully, for me, they can use headphones with this as well. My girls' favorite part is that it comes with 2 remotes. They can control their player with their remote….in the car. They think that is great! First up, I let each girl pack a backpack with items they wanted for their journey. I didn't really have any requirements other than that they had to be able to carry their backpack and they had to make sure they had enough leg room with their backpack filled up and near their feet. In the same area on the floor where they placed their backpacks(which you can see above), I bought them lap desks at Michael's. See that white round container in the middle? That is my smaller modified version of the idea of using a plastic cereal container for a trash container. It really helped keep the car neat. I filled it with one trash bag and placed an extra bag in the bottom. 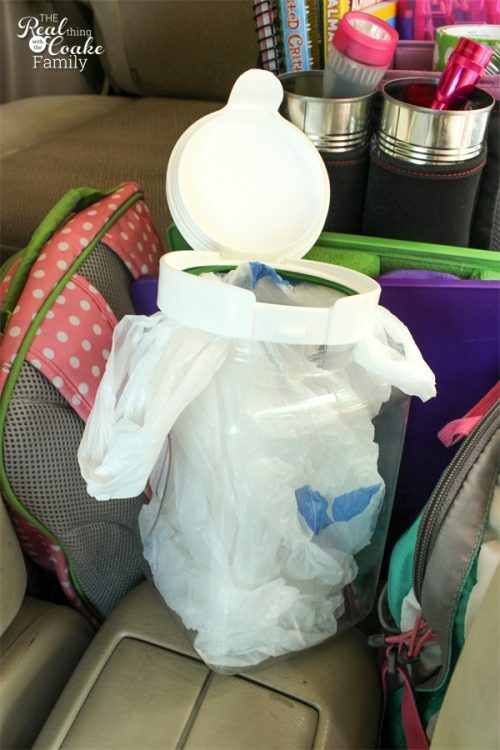 I also had extra plastic bags in the back of the car, which I showed you in my post about how to pack the car. (affiliate link) that fits perfect in our car. 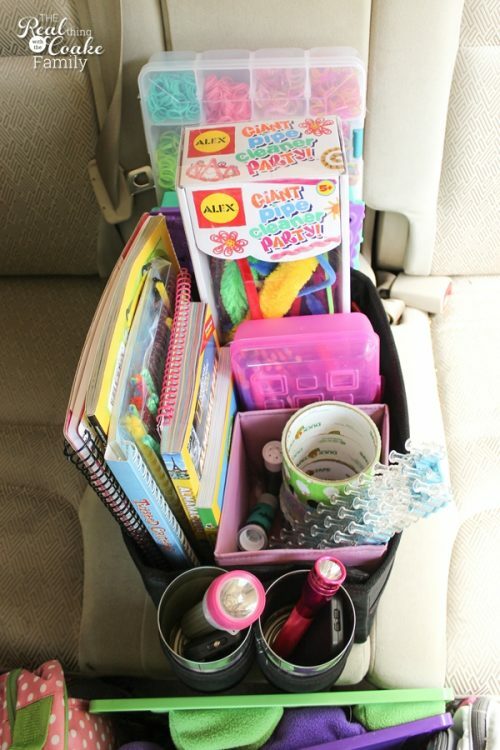 If you have a minivan or other car with more room, you can find organizers like this that are larger. This fit perfect in my car. 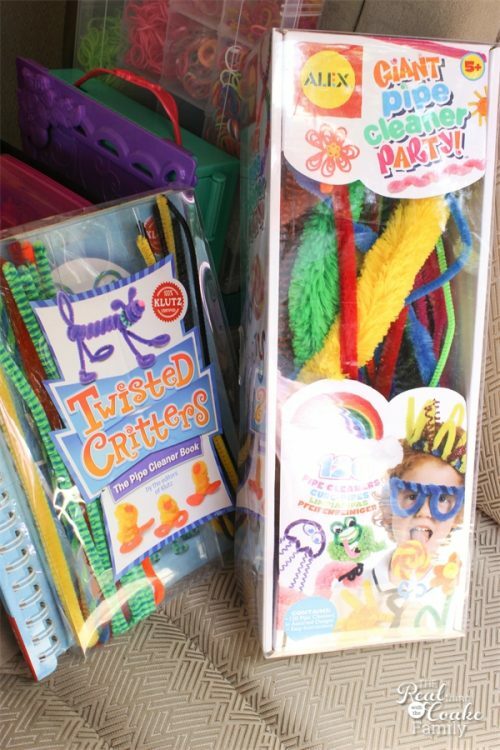 This is what we called our craft station for the kids…because essentially that is what it was for them. I wish I could have ridden in the back… it looks like so much fun. The cup holders, I filled with tin cans that had been emptied and washed. 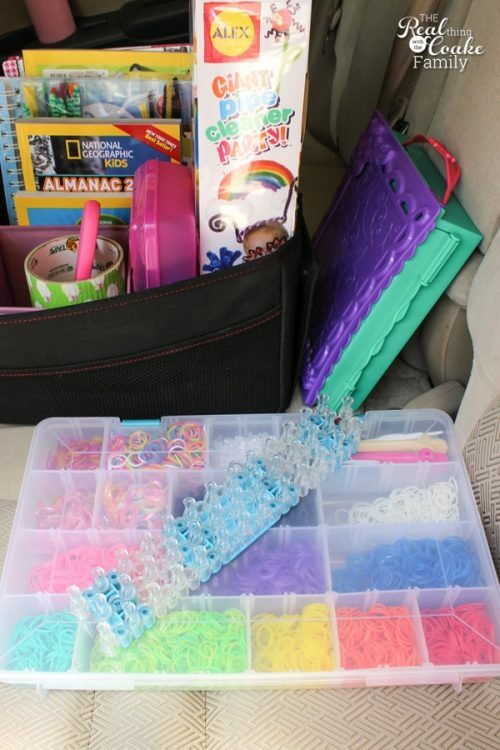 They were also a craft the kids could decorate any way they wanted with the supplies in the car. The tin cans held pens or colored pencils, especially when they were in use. It was a lot easier to keep them in here than in the bin I will show you later while they were using them. 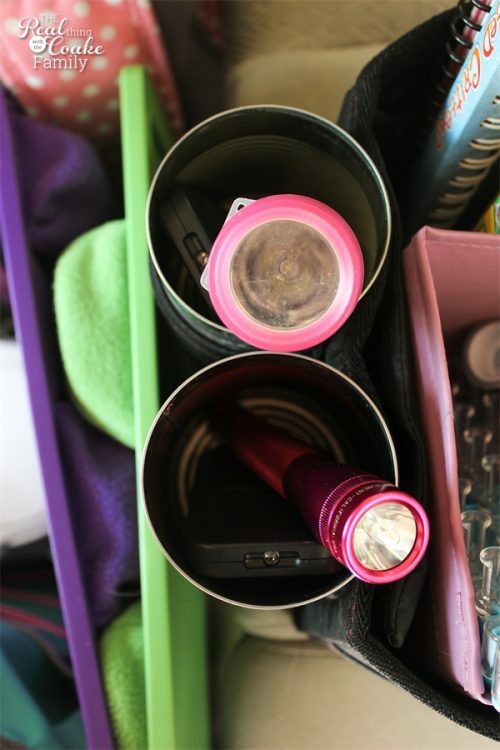 The cans also held flashlights and the remotes for the DVD player. Inside those tin cans was also the most played with item from the whole summer. I went to 5 Below before we left on our trip and bought a few cheap items that I could give them out on the road for something new to do. Silly Putty was one of those items. I gave it to them on our 8-day journey back to the East Coast. (affiliate link) for days….yes I said days! They are still playing with it. Had I known I could get days worth of entertainment from a $1 item, I could have saved a ton of money! 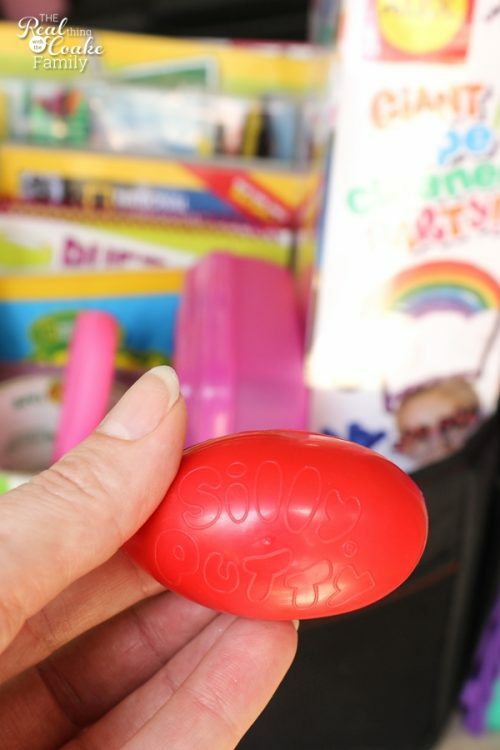 Try Silly Putty. It may not work as well for your kids as it did for mine, but it is worth the $1 investment to give it a try. 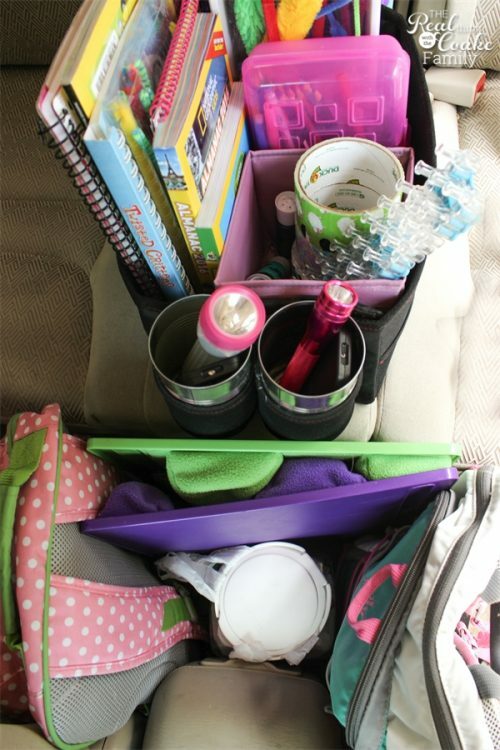 In the travel organizer, I also put an extra drawer organizer from IKEA. It just helped to have a place to contain the smaller things or awkward things that might roll around, etc. 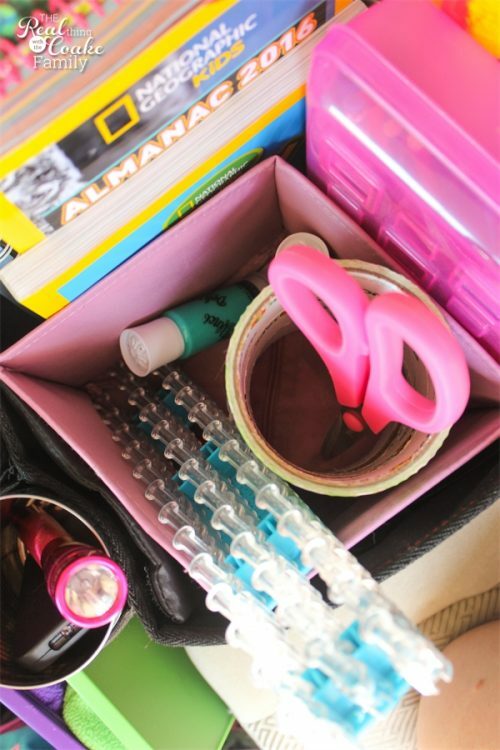 Just behind the drawer organizer from IKEA, I bought one of these little plastic pencil boxes at Target. Colored pencils, pencils, pens, scissors, a pencil sharpener, and a few washable markers went in here. I don't ever let my kids use crayons in the car (the whole melting factor) and I rarely let them use markers(I don't need a pink seat, thank you. ), but I did get a few fun markers for this trip. It might seem odd, but we actually had two pairs of scissors. Both because I have two kids and because we dedicated one pair to the duct tape and one for other things so the duct tape wouldn't gunk up our only pair of scissors. (affiliate link) because it looked like it had the best duct tape ideas in one book that we liked. It comes in a whole kit and I just ripped the instruction booklet off of the organizer box. We took all of the components, but it saved space to do it this way. 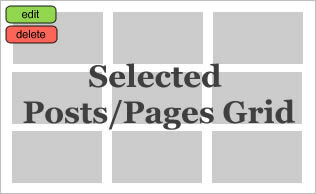 (affiliate link) stencil design portfolio. They both enjoyed them and used them quite a bit. Just like the Silly Putty was a favorite of the girls, the National Geographic Books were a huge favorite. National Geographic sent us free copies of the new 2016 Almanac as well as the Weird but True books for our journey this year. You can visit them and check out all of their amazing books on their website or on Pinterest or Twitter. We used the 2015 Almanac last year. I know my youngest daughter gave me EVERY quiz in the book. She loved the stump your parents quizzes….or maybe she just called them that. I never could look at the Almanac since I was driving. 😉 Whatever they are called, she gave me every quiz in the book. The Ultimate Road Trip Atlas was great because they could look where we were and where we were going on the map. They also found a few stops for us from this Atlas as it lists 5 fun places to visit in each state. I highly recommend any of the National Geographic books that are age appropriate for your kids. Next, to the Silly Putty, this was our most used item in their entertainment center. 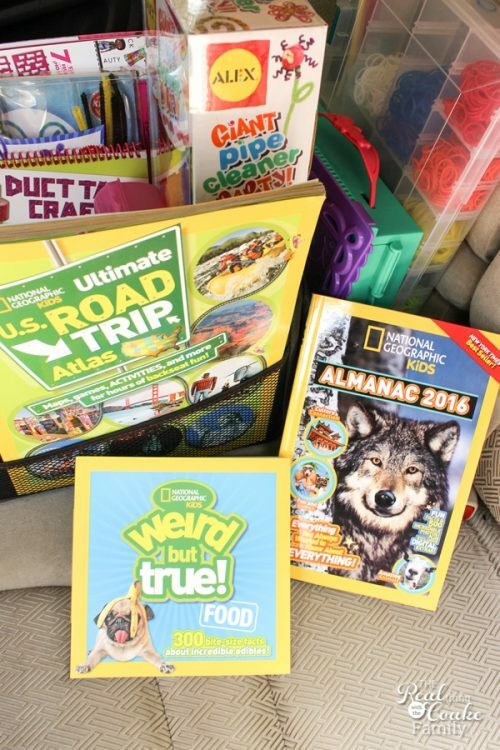 Pumpkin, my youngest daughter is anxiously counting the days until our next road trip because I won't let her even look at the 2016 Almanac until we are on the road. I'm pretty sure I know what she will do first on our road trip this summer! 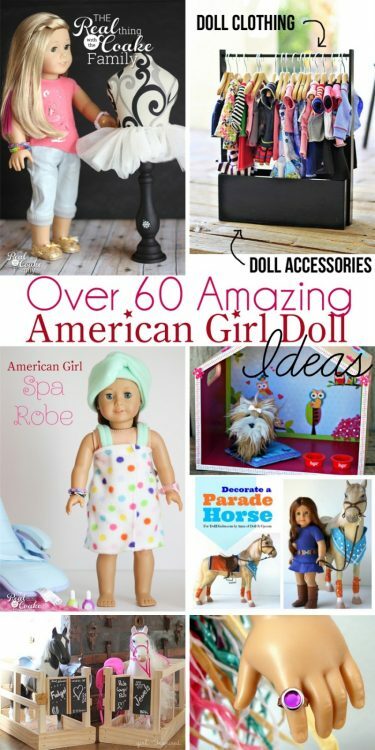 (affiliate link) because they are great entertainment for them and for me as well. (affiliate link). They had a ton of fun with these. (affiliate link) which has tons of great ‘recipes' of things to make. 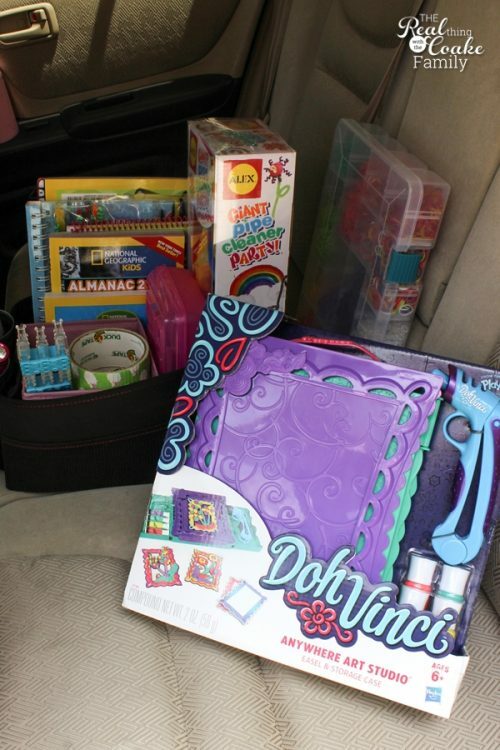 This summer we are adding something new and fun… Doh Vinci. Have you heard of it? It is from the makers of Play-Doh. I hadn't heard of it until I went to a recent blog conference. Doh Vinci was there and I got to play around with it. I realized that it would be an excellent craft for the car. They actually sent us a big complimentary box of Doh Vinci supplies, including the art studio picture both above and below, for our road trip this summer. You can check them out on their website or follow Hasbro on Instagram. Doh Vinci is kind of like Play-Doh, but everything comes in the tubes you can see in the art case above. You have the little ‘gun' type thing that you use to squirt the Doh Vinci out. You can use it on their templates(pictured int he middle above), which they have a lot of fun templates, or you can use it on pretty much anything…picture frames, ornaments, or these letters in the Hasbro Instagram feed. The possibilities are endless. 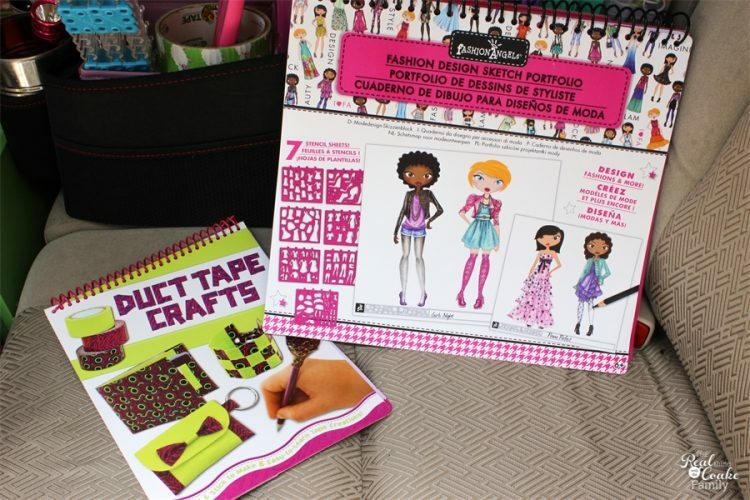 It is fun and creative and possibly a little addictive….says the mom who keeps doing her kids projects. LOL! It does require about 24 hours to be fully dry, so I will probably use the pink bin I showed you in my post about how we pack as a place to store them until they are dry. I think this is going to turn into another favorite item for this summer's trip. If you want to follow us on our latest road trip and see all our adventures and fun, follow me on Instagram. 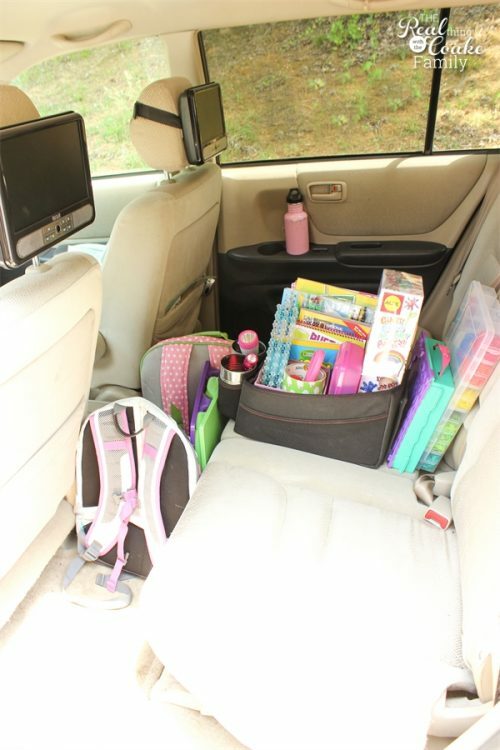 What tips or ideas do you have for entertaining kids on a road trip? I love all the storage suggestions. 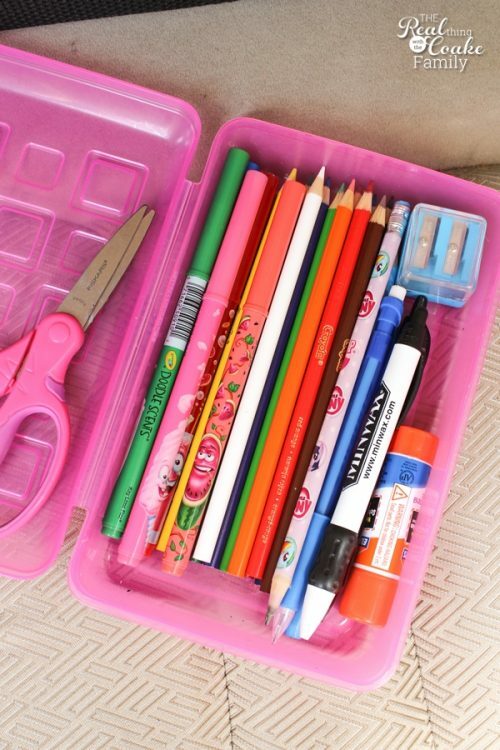 Using the tin cans for pencils and pencil crayons is a great idea! I have a son who is 10 and a daughter who is 8. Thankfully my daughter is very easy going and will watch any movie her brother wants to, or we would have had some very long car tripes. I feel the same way as you when it comes to DVDs in the car. We have newer vehicles but chose not to add any players. We also bought some inexpensive portable ones that go behind the headrest, and they are good enough for the amount that we use them. My kids also like to take their DS systems out of hibernation when we go on road trips, but they tire of those quickly, just like movies. Nothing beats playing games and drawing pictures, or all those cool craft kits that you shared. Good luck this summer! Can’t wait to hear about your adventure. Our kids are not out of school till June 30th, only one more month, I can’t wait till summer vacation! Our school year is 10 months, from The beginning of September till the end of June. Most Canadian provinces have a 10 month school year. I am pretty much done for the year by now. The next month will be hot days spent indoors at school instead of by the beach. Cracker Barrel always has some fun road trip type stuff. One we’ve been using for the last couple summers is ‘road trip bingo’- it’s reusable as the tabs fold down and can be folded back in when you’re finished. It’s one of my oldest’s favorite games. We have a dvd player, too, but thankfully my kids are big readers, so we don’t use it too much, if Mom can help it! Our most recent trip was 4300 miles and went smooth as silk! Sounds like a fun game! Thanks for sharing. We are trying a hangman game like that this year. It has done well so far. My kids have barely watched any movies this year…it has been surprising and great!